LinuxTag Berlin 2011 Share. Ask. Learn. LinuxTag in Berlin is one of the comprehensive Linux and open-source meetings in Europe. LinuxTag offers you a great variety of topics on Linux and open-source development for beginners as well as for professional. LinuxTag presents you over 300 talks and lectures on Business and Administration, Open Source, Security and hacking. The Open Source Arena at LinuxTAg is an open stage for free projects, business and innovative workshops. Over 100 company’s and independent projects will present their newest innovations and ideas. Last year over 10.000 visitors came to Berlin for Linux Tag and discuss ideas on an international basis, 45% of the talks are held in English. 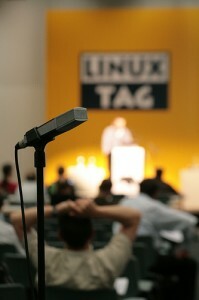 The LinuxTag 2011 will take place from 11.05. -14.5 2011 in Berlin at “Messe Berlin”. This entry was posted in Event and tagged 2011, Events, Linux, Messe Berlin, open source, Whats up in Berlin by U inn Berlin Hostel. Bookmark the permalink.